Looking for Lab Assistants jobs in University Colleges 2018 in AP? or Searching for Faculty Plus Teachers AP November 2018? 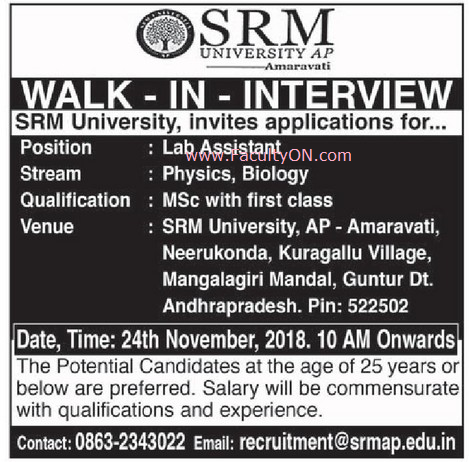 A college based in Amaravati named SRM University, Amaravati has advertised for recruitment of Lab Assistants jobs vacancies. Interested and eligible job aspirants are requested to walk-in on 24th November 2018. Check out further more details below. About College / University: SRM University, AP – Amaravati is a multi-stream research university with focus on diverse fields. From engineering to medicine and from liberal arts to management, SRM’s vision is to emerge as a world-class university that is globally connected, nationally relevant, and regionally transformative. It has the ambitious plan to be in the top world class universities in ten years with 20000 + students and 1500 faculty members. How to Apply: Interested and eligible candidates are requested to attend the Walk-in interview along with CV, originals & copies of certificates, PAN card, Aadhaar card and recent passport size photos to the walk-in address given below.